Downy Woodpeckers are small woodpeckers, only about 6" in length. They have white bellies, black and white striped heads, and black wings with white spots. Males have a red patch on the back of their heads. Downy woodpeckers look similar to Hairy woodpeckers, but they are smaller and have shorter bills than the Hairy. Downy woodpeckers are cavity nesters and require dead wood in which to excavate nests. Range: Downy woodpeckers inhabit most of the United States and Canada. They do not migrate. 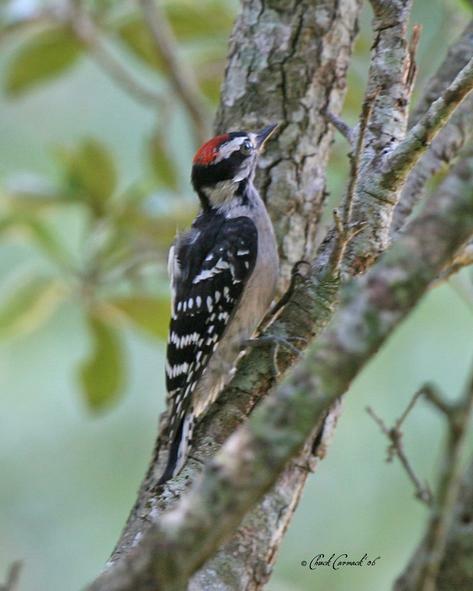 Downy woodpeckers live in open woodlands, forest edges, suburbs, parks, and orchards. Diet: Downy woodpeckers eat mainly insects found by hammering at dead wood. Their favorite seed is sunflower hearts and they also love peanut suet cakes. Downy woodpeckers also eat black oil and striped sunflower seeds, safflower, and cracked corn. They will feed at tube feeders and suet feeders. At Wild Bird and Garden we have foods that downy woodpeckers love like our Woodpecker Favorite seed mix, peanut suet, and sunflower chips.